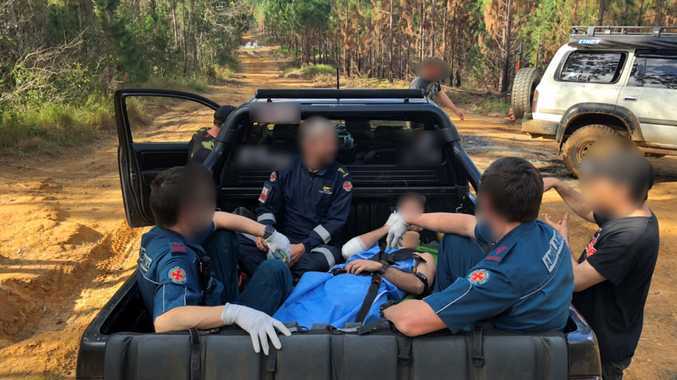 A TEAM effort between paramedics, four-wheel-drivers and a helicopter has been required to rescue a forestry crash victim. Emergency crews were called to a track off Beerburrum-Woodford Rd at 12.30pm Sunday. 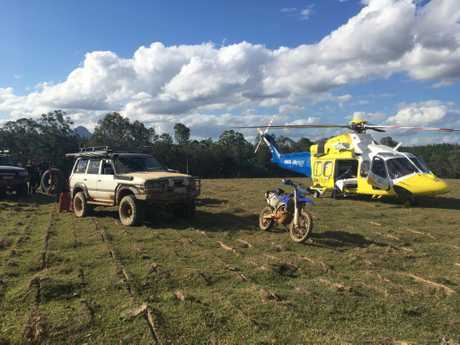 A Queensland Ambulance Service spokesman said a man aged in his 20s was injured in a motorbike crash in "fairly inaccessible" country. The spokesman said paramedics in a four-wheel-drive were able to get to him about 45 minutes after the alarm was raised. The RACQ LifeFlight helicopter winched a critical care doctor and a paramedic to the site. Feedback from the scene indicated the bike had fallen on the man, causing a broken leg and hip injury. The spokesman said people local to the area had also driven four-wheel-drives to the scene to assist the injured male. Emergency medical staff then rode with the man in the back of a ute to the helicopter which took off at 2.53pm bound for Sunshine Coast University Hospital.